Is there room for all rasas in the Gaudiya Lineage? Whenever somebody (isckon) had a statement to show that Narayana Majaraja (Gurudeva) preached something different from Srila Prabhupada, Gurudeva refuted it. There is even a book which lists the different misconceptions and refutations: Our Gurus: One in siddhanta, one in heart. Very good examples of misconceptions is that one couldn’t speak about the pasttimes of manjaris and whether the jivas fell from vaikuntha or the tatastha region. The speciality that Gurudeva came to give us was the manjari mood. Nobody had spoken openly about this until Gurudeva received the blessing to do so. It wasn’t forbidden, just hidden. That Gurudeva had to clear up some misconceptions after Srila Prabhupadas disappearance was to be expected. So isn’t it to be expected that there will be some weeds that needs to be cleared after Gurudevas disappearance as well? The devotees may have matured in their understanding, but that doesn’t mean there still isn’t things to deal with. The belief that the Gaudiya lineage can only contain those in manjari mood seem to be one of the weeds that have grown. There is two misconceptions that are linked: Caitanya Mahaprabhu only came to give the manjari mood and that one can only be a rupanuga if you follow Rupa Goswamis mood. Caitanya Mahaprabhu had external and internal reasons to manifest himself. One of the internal reasons was to taste the manjari mood (and more specifically Srimati Radhikas moods). So can only those who follow the inner mood of Mahaprabhu be a follower of him? Sri Caitanya Caritamrta, Adi-lila 3.19 refutes this. Mahaprabhu came to distribute the four rasas to everybody, but He Himself relished the madhurya mood. So do you have to only follow Mahaprabhus moods to be a follower of His teachings? Of course not, the verse refutes this. The same thing with who can be called a rupanuga. You don’t have to follow Rupa Goswamis moods to be a follower of His teachings. His book “Bhakti-rasamrta-sindhu” delineates how to go from the lowest stage of bhakti until prema. If you have a mood different from manjari, you can still follow the stages Rupa Goswami has described, and therefore follow his teachings. It would be strange of our Parampara could only consist of manjaris. That there is a predominance of manjaris in the parampara is without question, but if it only could be manjaris – where would the other rasas go? The spiritual world supports all the rasas and somehow they even manage to cooperate to serve Krishna. But in this world we have to create a distinct line between the rasas without cooperation? The different rasas have to have different lineages? It doesn’t make sense. Nowhere is there a lineage below the Brahma sampradaya that says that each rasa has their own lineage. There may be certain villages and biological families that have a predominance of a certain mood, but that doesn’t make them a lineage in their own right. The community and village of Saptagrama were especially blessed by Nityananda Prabhu (from O My Friend). Even the origin of our sampradaya and creation (Lord Brahma) is in sakhya-rasa. Narada is a bit of a special case, but he is identified with Madhumangala-sakha. As Narada he is in dasya-rasa, but Krishna also had Narada experience madhurya-rasa as Naradiya Gopi. Vyasadeva appears in Gaura lila as Vrindavan Das Thakura who also had the cowherd boy Kusumapida inside of him. 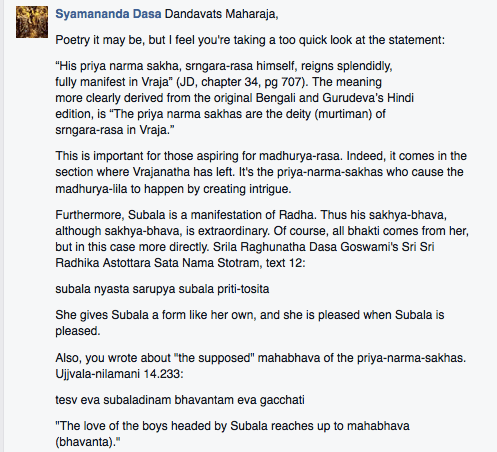 Sukadeva who is in dasya mood, but somehow still was given the empowerment to speak Srimad-Bhagavatam. Why would we limit Nityananda so? Are we afraid that if our mood is madhurya, that Nityananda can’t give it to us? Do we think that Nityananda can’t arrange the madhurya mood to manifest in us? There is no need to create boundaries for what siddha-dehas can do, they are expert at arranging Krishnas pastimes. They are probably expert at “arranging” us conditioned beings as well. It becomes doubly laughable, because who is the original spiritual master? Nityananda who is the first direct manifestation of Balarama. To say he isn’t in our Guru parampara because he has sakhya bhava is apasiddhanta. I would happily receive guidance from a pure devotee in another mood than mine, and I will have no doubts that he will be able to arrange the blossoming of madhurya mood in somebody else. I would even go so far and say that (S)He is in the Gaudiya Lineage. It’s not so far fetched really. Translation faults: Gurudeva said… what? The mixed-rati side claims that Gurudevas words are open for interpretation where he never specifically states that Srila Prabhupada is a manjari, but instead focuses on the madhurya aspect of Srila Prabhupada. So, whenever there’s a philosophical debate it becomes important that whatever translations of Gurudevas words are as close to the original message as possible. The madhurya rati side have brought forward especially one such quote which deviate a little bit from the audio. The deviations has been marked with uppercase letters. Sayarsi dasa: One of my god-brothers named Maha-mantra, took sannyasa within Isckon society and is now living in New Vrindavan. He talks about and follows the path of sakhya rasa. He says that Srila Prabhupada is a priya-narma-sakha. Is it possible for Srila Prabhupada to be a manjari and at the same time train his disciples who are in sakhya- rasa? Srila Narayana Goswami Maharaja: All rasas- santa ,dasya, sakhya, vatsalya, and madhurya are present in the gopi”s madhurya mood. The gopis can manifest santa, dasya, sakhya, vatsalya and madhurya. Sayarsi dasa: Is it okay for a particular disciple whose stayi-bhava maybe in sakhya-rasa to see Srila Prabhupada as a priya narma cowherd boy? Srila Narayan Goswami Maharaja: SOMEONE CAN THINK LIKE THAT, IF HE DESIRES BUT he is quite wrong. Wrong and wrong and wrong. Brajanath dasa : That sannyasi quotes from Jaiva Dharma, where Vijay Kumar and Vrajanath see their guru in two different ways. One sees him as a manifestation of Subal as Priya-narma -sakha, and the other sees him as an intimate sakhi of Srimati Radhika. Srila Narayana Maharaja: What name? Srila Narayana Maharaja: I know him very well. Sayarsi dasa: He has been talking about preya rasa, cowherd boy fraternal relationship, he has been following this path and he has been saying that Srila Prabhupada is a priya-narma sakha. That can also be true if he is manjari, he can also train his disciples who is only in sakhya rasa? Srila Narayana Maharaja: You should know that in gopis mood, all rasas are there. sakhya, dasya, vatsalya all are included. They can manifest sometimes santa rasa, dasya rasa, sakhya rasa, madhurya rasa. All. Sayarsi dasa: But for that particular disciple who may be sthayi bhava, may be sakhya rasa. Srila Prabhupada may be appearing to him like a cowherd boy, like a priya-narma sakha? Madhava Maharaja: This is a conclusion of his mind. Sripad Bhagavat Maharaja: This sanyassi is saying that Srila Prabhupada my Swami Maharaja in in sakhya rasa, he is a priya-nama-sakha. That is his conclusion. His idea. Srila Narayana Maharaja: Oh, he is quite wrong. Wrong and wrong and wrong. Srila Narayana Maharaja: Let him do, no harm. Brajanath prabhu: He tries to explain like in Jaiva Dharma, Vijaya Kumara and Brajanath. One is seeing him like Subala, like priya narma sakha, another like an intimate sakhi of Srimati Radhika. Srila Narayana Maharaja: Anyone can be like that, no harm, but actually for Swamiji he was not in this. Srila Narayana Maharaja: He has come in the line of Caitanya Mahaprabhu, Rupa Gosvami, so he must be like them. Because he has written in his books. Sripad Bhagavat Maharaja: I am the servant of Radhika. He has written like that. I am the servant of Radhika. If we hear the original audio, we see that what is wrong can be understood based upon the listener’s understanding. We can also understand that Gurudeva is saying that a priya narma sakha only have sakhya rasa to be wrong, that priya narma sakhas also have madhurya. So this quote can be understood both ways – as a validation for both the mixed rati and madhurya rati side. The change also makes the mood heavier, it really emphasizes what the madhurya rati side wants to be true. If we deviate too much from the original message, we may come close to the quote: “If anyone thinks he can correct the writing or teachings of our Gurudeva”, however intentionally or unintentionally it’s done. One of my favorite pages on Facebook is Gaudiya Vedanta Publications, and especially when they come with information on new publications. I think they are doing a good job. So please, try to stay close to Gurudevas own words. We now see how important this is whenever some philosophical debate arises. Nemi Maharaja posted a new entry in regards to why he believe that Srila Prabhupada is a gopi. It’s a nice reflection on why he believes what he believes without the “fighting” or “we must defend” mentality. I have truly appreciated and loved the feeling behind the last two postings he has. This is responses where the temperature has fallen in the debate and instead a loving mellow is seeping through. It’s just so nice! It’s so wonderful to admire the response of a person who you disagree with. It’s so lovely to admire how he presents his case. This is beauty. I also very much appreciates that Nemi Maharaja kept his posting public. It takes a lot of strength to posts publically and spend the time dealing with comments, but Nemi Maharaja is doing the effort. There usually is a lot of inappropriate comments when they do so, but my take is that it’s an opportunity to work on an individual. There may be inappropriate comments, but by dealing with them authentically we can hopefully raise peoples awareness while still disagree. The bad side, we don’t see any change happening as this usually take a lot of time. I’m sorry to see that many devotees only posts controversial issues among their friends, though I do understand that dealing with the repercussions can be very hard. So, let’s speak on the message again. Nemi Maharaja again goes back to the view that Gurudeva lied to his disciples. I’m sorry to see the word “lie” coming back. I slowly had to understand that this isn’t about lying, but that Gurudevas words can be intepreted both ways. Gurudeva speaks in a hidden way. So can we please instead use something other word than lying? For example, I used to refer to this debate as a “controversy” and “conflict”. I have moved away from those words and instead use “debate” and “discussion”. I saw how these words increase the division and conflict, and therefore I changed how I wrote. Words have power. We have a responsibility to consider how we use them. At least I hold myself responsible and to keep on improving how I relate. “There are so many higher realities that Srila Prabhupada never talked about, because we were not ready. So very true. But didn’t Gurudeva explain Srila Prabhupada to the iskcon devotees and revealed so much understanding that was missing…. because you were not ready? Is it so hard to imagine that may be the same can be true of Gurudeva. That there are so many higher realities that Gurudeva never talked about, because we are not ready? The rasa of Srila Prabhupada is one of these issues. When we read the books of our acaryas, they reveal themselves and their mood. Each acarya sees the world through colored lenses. The color is the mood they have, so their understanding of madhurya is different depending on their mood. The Gopas know of the gopis and they know they have this madhurya mood, but their view on madhurya will be different. But what is the meaning of madhurya? Madhurya means not to have any aisvarya. In madhurya you may have dasya-rasam, sakhya-rasam, vatsalya-rasam and sringara-rasam. Rasas are different. And those who spontaneously have an attachment toward a particular rasam they will cultivate it from the beginning and they will get it. Not all jivas must become madhurya-rasa or srngara-rasa devotees. But is is said that adya eva paro rasah-srngara rasam is the superior. Amongst all rasas, srngara-rasa is the supreme. ….For example, Dama and Sudama have their particular rasam with Krishna and those who are attracted by that rasan have to take them as their Gurus. Similarly those who have a tendency toward vatsalya-rasam have to accept Nanda or Yasoda as their Gurus. This in madhurya bhava. In this way the devotees will proceed. Look at how Puri Maharaja define madhurya. No talk on manjaris etc. Acaryas writing and definitions reflects what mood (and understanding) they have. If you are a gopa, wouldn’t you consider your mood to be the highest and best? If you are a manjari, wouldn’t you consider your mood to be the highest? A manjari and a gopa meets and they begin to bicker about which mood is the highest. A gopa will say: “I built the temple with the highest point, so our mood is the best”. A manjari will say: “Krishna goes away from the temple to meet our svamini, so our temple attracts Krishna more”. So it will continue and it will be lovely because it’s a transcendental bickering. Acaryas understand the vedas based on their mood. This understanding is important for us sadhakas so that we can get closer in understanding our sadhu-sanga. Nemi Maharaja has made a video explaining his point on why he means Srila Prabhupada can’t be a priya-narma sakha. The video is excellently made! The sound quality is fantastic, he explains his point in a very simple way that I think all devotees will be able to follow, the surroundings are nice and he keeps his message so short that everybody will watch the video to the end and not get lost on the way. I mean, it was just excellently made! I loved it ! Quality in the making. Truly, excellent work. Syamananda Prabhu mentioned that the last contribution of Nemi Maharaja is a rehash of Prema Prajoyanas postings. I haven’t mentioned Prema Prajoyans (PP) contribution much, because it was at that point things got beyond my head in this debate. It just became too deep. But now it seems the time has come to push through this barrier and look at this issue from both sides. That the primary rasa (sakhya bhava) does not disappear. That PNS have a difference of service from the manjaris. sa gokule tu subalas tathä syäd arjunädayah. Madhuro-bhava is sandhi and not samas. Here the word madhurah is visesan, the word bhava is visesya and the word bhavita is kriya. So it means that Subala-sakha is absorbed in madhura-bhava. This means Subala is not the doer but madhura-bhava is the doer. For this reason Subala is decorating the kunjas and also arranging the meetings between Radha and Krishna.This is not only anumodana but he is also absorbed in madhura-bhava and is tasting it. KBM: PRIYA NARMA SAKHA SUBALA IS NOT SAMBHOGA-ICCHA-MAYI (IN SAMBHOGА-RASA). So on the first disagreement “That the primary rasa (sakhya bhava) does not disappear.” The madhurya-rati side makes light of the usage of the work sakhi-bhava in Ujjvala-nilamani 2.13 and emphasizes anumodanam. So no matter how one decide to interpret the word sakhi-bhava, one should be careful to take it lightly. In such a case one also have to consider if there is further ways to understand the word sakhi-bhava. Their purusa-bhava (male mood) is covered by sakhi-bhava (Srila Jiva Goswami). Priya-narma-sakhas are sakhi-bhavabhavita:it means that they are not sambhoga-icha-mayi. Maan (jealous anger): Priya-narma-sakhas are not separately tasting maan but through tadatma-bhava of Radhika. “The priya narma sakhas are eligible for srngara-rasa to some extent.” (JD chapter 30, 625). “Sakhya is also of two types: siddha sakhya and unnati-garbha sakhya. The characteristics of siddha sakhya are that rati, prema and pranaya are in a fixed unchangeable form. In unnatigarbha sakhya there is a sprout of vatsalya and kanta (madhurya) bhava… When sakhya rasa is nourished then it will become either vatsalya rasa or madhurya rasa.” (Premapradipa). The next barrier I will have to try to break is in regards to mixed moods which continues this discussion and PPs use of anumodanam which he rests much of his case upon. All I can say is that I’m trying, but I don’t think I have even scratched the surface of understanding.